Day 2: Saturday 4 February 2017: Hanoi (FB,L): This morning visit historic Ho Chi Minh Mausoleum (view from outside) and see Ho Chi Minh’s former home, then the iconic One Pillar Pagoda. Continue to the Temple of Literature, Vietnam’s ﬁrst university, then take a walking tour through Hanoi’s historic Old Quarter. You’re Invited: Stop for lunch at KOTO restaurant, a unique restaurant that trains disadvantaged street children. You’re Invited: Attend a traditional Water Puppets performance then go backstage to meet the puppeteers. Day 5: Tuesday 7 February 2017, Hoi An (FB,D): This morning take a short guided walking tour through the World Heritage listed ancient town. See old merchant’s houses, a mixture of Vietnamese, Chinese and Japanese architecture, including the beautifully carved Japanese Covered Bridge as well as the Assembly Hall of the Chinese Congregation. You’re Invited: Join the Lifestart Foundation, an organisation that assists the underprivileged in becoming self-suﬃcient through the production of traditional handicrafts. Visit the studio of a local painter who will teach you the art of Vietnamese painting. Afterwards, enjoy a lantern making class. The afternoon is free for you to discover this wonderful town. Day 6: Wednesday 8 February 2017: Hoi An (FB): Today is free to explore Hoi An and it’s surrounds. Discover More: Learn how to cook like a local at a Vietnamese cooking class, Tour the historic ruins of the Champa Kingdom at My Son, or Relax and enjoy a tranquil evening in the Hoi An countryside with a sunset (additional expense). Day 9: Saturday 11 February 2017: Cu Chi Tunnels (FB): You’re Invited: Travel to the infamous Cu Chi Tunnels. Join a Vietnamese Veteran and learn of the wars, strategies, atrocities and the resourcefulness of the Vietnamese. Hear fascinating stories from ﬁrst-hand experience to allow a real insight into the Vietnam war. Discover More: Evening street food walking tour, Vietnamese Art History tour, or Saigon old and new tour. Day 11: Monday 13 February 2017: Cai Be – Sa Dec (FB,L,D): Board sampans and sail through Cai Be’s ﬂoating market Pass the city’s French gothic cathedral, tour Anh Kiet House, then visit a traditional rice factory. Observe daily routines of the villagers before stopping at a local brick factory. Upon arrival to Sa Dec, visit the home of Mr. Huynh Thuy Le, who inspired Marguerite Duras’ novel, L’Amant (The Lover), and take a walk through the town’s market. Day 12: Tuesday 14 February 2017: Tan Chau – Vietnam/Cambodia border crossing (FB,L,D): Sail to a Cao Dai temple, then ride a Vietnamese tuktuk to a mat weaving workshop. Cruise to a ﬂoating ﬁsh farm, and visit Evergreen Island. 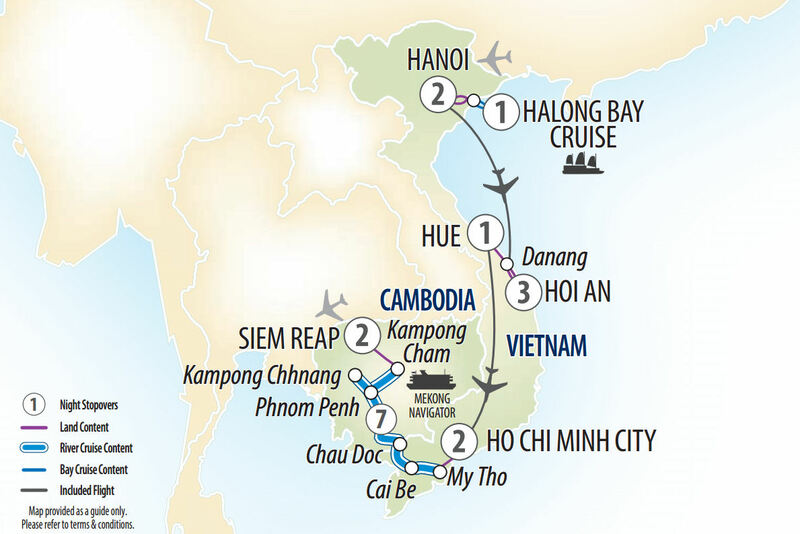 Reboard the ship and cruise to the border and Phnom Penh. Sous Sdei and welcome to Cambodia! Day 13: Wednesday 15 February 2017: Phnom Penh (FB,L,D): Cambodia’s capital Phnom Penh was once known as the “Pearl of Asia”, but it was almost entirely evacuated by the Khmer Rouge in 1975. You’re Invited: Meet our cyclo drivers for a city tour of Phnom Penh. Journey to the Royal Palace complex and the National Museum housing Angkorian and pre-Angkorian artifacts. You’re Invited: Enjoy a performance by the Cambodian Children’s Group which includes Cambodia’s national dance as well as local traditional folk dances. Day 14: Thursday 16 February 2017: Phnom Penh (FB,L,D): Visit the Killing Fields, continue to the Tuol Sleng Genocide Museum, a former school that was converted to the main prison and torture headquarters of the Khmer Rouge. You’re Invited: A traditional shadow puppet show will be performed before dinner. Day 15: Friday 17 February 2017: Tonle Sap River – Kampong Chhnang (FB,L,D): Sail up the Tonle Sap River and cruise past ﬂoating villages at Kampong Chhnang. Day 16: Saturday 18 February 2017: Wat Hanchey – Kampong Cham HD (FB,L,HD): Visit Wat Hanchey which oﬀers views of the Mekong River. You’re Invited: Receive a traditional Buddhist Water Blessing from the monastery’s resident monks. See Phnom Pros (man hill) and Phnom Srei (woman hill), the reclining Buddha, and the preaching Buddha. Our ﬁnal visit is to the Angkorian-period complex of Wat Nokor Bachey. Return to the ship and gather for a farewell reception and Royal Cambodian Theme Dinner. Day 17: Sunday 19 February 2017: Kampong Cham – Siem Reap (FB): Disembark and bid farewell to the RV Mekong Navigator and her crew. Transfer to Siem Reap, the gateway to the magniﬁcent Temples of Angkor. Two Night Stay: Shinta Mani Resort. Discover More: Uncover either Bantey Srei or Beng Mealea, take a Cambodian cooking class, or Explore the Roluos temple group. Day 18: Monday 20 February 2017: Angkor Temples HD (FB,HD): Start at the famous Angkor Wat, continue to the unique Ta Prohm temple. Visit the impressive Bayon Temple, and ﬁnish at the Terrace of the Elephants and the Terrace of the Leper King known for their intricate bas-reliefs. This evening enjoy a farewell banquet. You’re Invited: Finish at the incredible Phare Cambodian Circus, a spectacle of acrobatics, theatre and music. Phare is an NGO founded by Cambodian refugees to assist disadvantaged young people by teaching them performing arts. Day 19: Tuesday 21 February 2017: Depart Siem Reap (FB): Transfer to Siem Reap airport for your onward ﬂight.